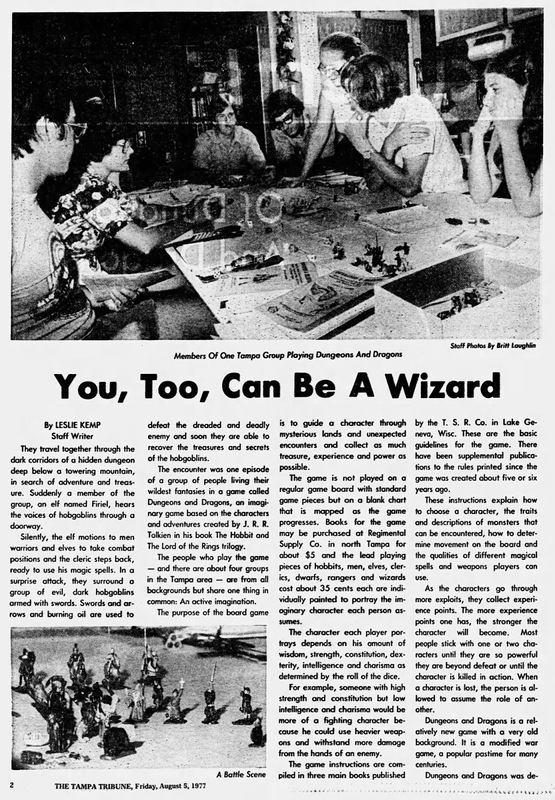 Leslie Kemp, in the summer of 1977, gives us a rare mainstream perspective on the progress of Dungeons & Dragons, this time in the city of Tampa, Florida, for the Tampa Tribune. She reports the existence of four D&D groups known to her at the time, and calls it a game that "is just now gaining popularity." No doubt a notice in a major city newspaper would boost that, especially with the promise that "You, Too, Can Be a Wizard." The debut issue of the Strategic Review carried the first expansions to Dungeons & Dragons to appear under TSR's imprint, including rules for solo gaming which Gygax credited to himself and George A. Lord. It can be hard to glean deeper insight into how these early systems came together, but the excerpt shown above relates a second-hand summary of Lord's initial correspondence with Gary Gygax about potential approaches to solo D&D. The account was written by Scott Rich, and it appeared in the eleventh issue of his Midgard Ltd. campaign's newsletter Midgard Sword & Shield from October 1974. Notably, Rich appends a parenthetical suggestion that has some striking similarities to the rules that TSR would imminently publish. Vintage Ad: Slain Any Wicked Dragons Lately? 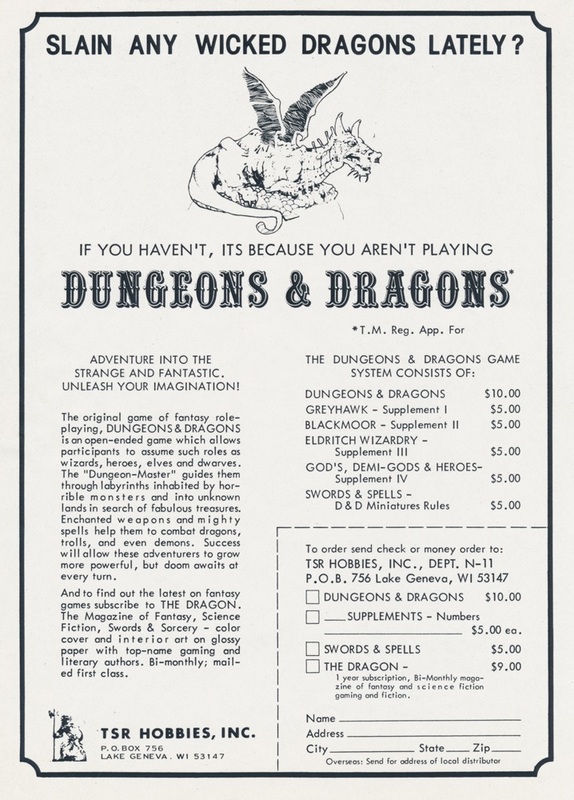 This D&D advertisement dates from the second half of 1976, a stopping point when TSR would release no new material for the original Dungeons & Dragons game and hadn't yet put anything out to replace it. The body text is familiar from other contemporary advertisements, but the form given shown here let you order a white box, all the supplements, a Swords & Spells, and a subscription to bi-monthly The Dragon magazine. The cover of that magazine's first issue supplied the slayable fellow shown at the top. The original Dungeons & Dragons rules invited fans to make their own additions and modifications to the system, and many early adopters took TSR up on that offer. While some of the unofficial supplements and variants they produced became classics, others fell into total obscurity. Keith Abbott's Loeran Supplement is one that received notices in many fanzines of the day, but ultimately reached a very small audience. 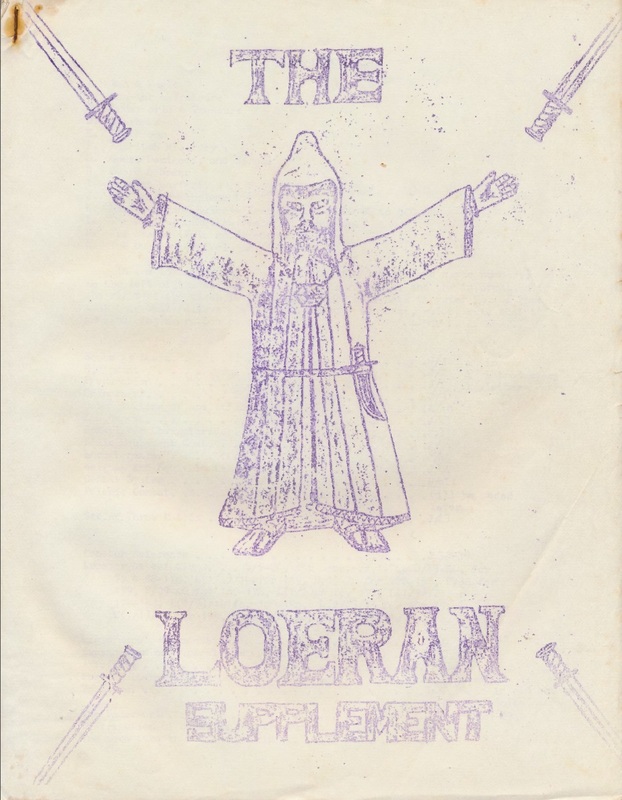 It is of interest, however, as Loera was an early attempt to create a massively-multiplayer tabletop game: as the supplement says, "to create the first effective world-sized campaign."